Click on the Play Button and 'Metal Slug: Run!' will start after this message... Thanks for waiting! Similar games to Metal Slug: Run! Enjoy this action-packed platformer where your only goals are to shoot, kill and survive! Dodge bullets and bombs and move around as fast as possible. Look for ammo and health packs and defeat your enemies to save your country! 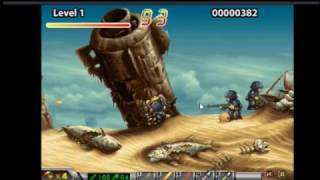 Click Play to see the videoguide for Metal Slug: Run!